Joe Pass always talked about the importance of motion as it pertains to solo guitar. 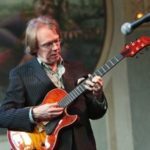 In this Master Class, Steve illustrates techniques to create motion using common chord forms. You and he will begin with triads and create lines in parallel and contrary motion while maintaining some common chord tones. After examining many kinds of voice motion within one chord, you’ll apply these concepts to a progression. This is in essence what the George Van Eps volumes were all about: looking at chords as several voices forging ahead over time to arrive at familiar destinations along the way. You’ll be pleasantly surprised to discover many new shapes getting from one chord form to another by sending the voices in motion. Steve will also show the application of these principles over familiar standard tunes. You will never look at those chord forms the same way! Another dynamic solo guitar lesson from Steve Herberman. He has assimilated the stylistic and technical contributions of George Van Eps, Lenny Breau and others and presents them in clear, logical fashion. These concepts when practiced will ignite a fire under your chord-melody playing. As always, Steve is very well organized and the lesson is packed with information, including ideas on how to practice this approach. Not to to mention his incomparably beautiful playing of standards such as Here’s that Rainy Day and Street of Dreams. Another essential for the aspiring solo-jazz-guitarist.